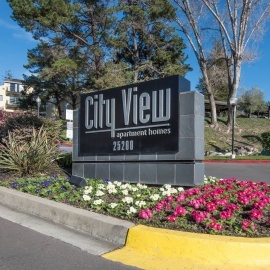 Stop and breathe in the fresh air at City View Apartments in Hayward, California. Our studio, one- and two-bedroom apartments offer spacious designs with multiple floor plans to choose from. Private patios/balconies offer a relaxing place to kick back and enjoy your surroundings. Staying fit and healthy is important, and these Hayward apartments provide plenty of ways to keep active right outside your front door. Catch up on celebrity gossip while working up a sweat on one of our numerous cardio machines in the fitness center, or challenge a friend to a match on the tennis courts. Kids will love wearing themselves out on the community playground, and you can be sure Fido will get plenty of exercise at our dog park (yes, of course we’re pet friendly! ).